Gary Schwitzer is founder and publisher of HealthNewsReview.org. He tweets as @garyschwitzer. 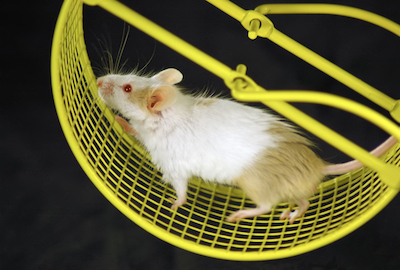 It took the Joslin Diabetes Center four paragraphs and three mentions of fathers – as in, “how a father’s exercise regimen would affect his offspring’s metabolic health” – to finally mention that its research news release was about mouse fathers. A new study on mice could provide some exercise-related motivation for wannabe fathers to get off the couch and start working out prior to conceiving a baby. Really? Would you really expect or want a wannabe father to jump off the couch in response to a mouse study? Whether the results hold true for humans remains uncertain, but they support the notion that some of the benefits of exercise are somehow passed on to the next generation. Lane cautions that researchers don’t know whether exercise provides the same benefits in people, so it may be too early for would-be fathers to start training for marathons. Uncertain. Too early. Far less than proof that a human Dad has (or needs) a new reason to get off the couch and hit the gym.